Spent a lawyer’s week (4 days) immersed in hounds, hounds, and more hounds in Louisville, KY.
Not judging, but learning “everything I always wanted to know, but didn’t know who to ask” about hounds. 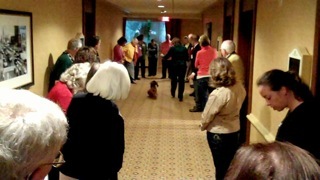 The occasion: the American Canine Education Foundation, Inc.’s(1) Hound Group Institute, March 13-17, 2013. This non-profit organization, although now separate from the SCJA, had its beginnings with the Senior Conformation Judges Association, founded in part by Lt. Col. U.S.A.F (Ret.) Wallace H Pede, an AKC judge, who serves as the Chief Executive Officer of both groups. This year’s Institute began with “Movie Night” on Wednesday with the showing of Karen G Armistead’s award winning “A Key to Movement”. I highly recommend this movie for beginning judges as it certainly breaks down and isolates movement keys of dogs Going Away, Coming Toward You, and Viewed from the Side. It was a great prelude to the next four days of Hound Breed study. The tightly organized schedule was under the watchful eye of the Institute Director of Education for ACEF, Nina Sherrer, an accomplished author of such notable articles including “Sticking to the Standard, a Study of the Weimaraner”, and “In One Judges’ Head—Guide to Presentation Skills.” She has created presentations for the UKC specifically for judges: Judging Juniors, Judging Varieties, and Speaking the Same Language. Additionally, Mrs. Sherrer is an UKC all-breed judge including all Groups, Junior Showmanship and BIS. Her attention to detail and sense of organization, helped make the shortened week one filled with a variety of activities including drawings for dog-related prizes, ACEF Hound Institute Survival Bags (containing refreshments and snacks) each day and a final day drawing for an Amazon Kindle e-reader. Also available to early registrants was a highly prized “refund of tuition” drawing on Saturday evening. Nice perks for attendees. Mrs. Sherrer was the engine that made the week run. She was responsible for organizing and reorganizing the breed presentations to accommodate the judging schedules of breeds at the Louisville Kentuckiana Dog Show Cluster being held concurrently across the interstate highway. 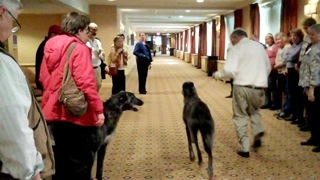 She held a tight rein on all the activities in order for the attendees to have available Hound breeds for our observation. Although not a “hands-on” some breed presenters gave us an opportunity to watch movement, examine certain aspects of a particular breed, as well as converse with those bringing dogs. When you look at the Hound Group and see 28 breeds listed, a brain freeze can occur due to potential cerebral overload when that many breeds are presented in such a short time. The format of the presentations included Parent Club approved breed presenters (handlers, breeders, owners, breed representatives, and judges) discussing all the standards, as well as some hands-on, and movement observation. This was a great amount of information/experiences to acquire in such a short time frame. However, to meet AKC’s Institute requirements, each presenter included history, form and function of the breed as well as an in-depth consideration of the breed standard. A presenter was also required to allow ample time for a question and answer period and give an AKC 15-question breed test. 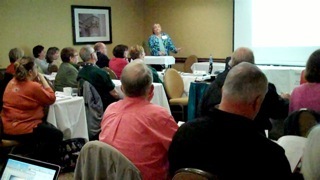 There were a variety of materials distributed, visuals presented, and presentations viewed during the week. 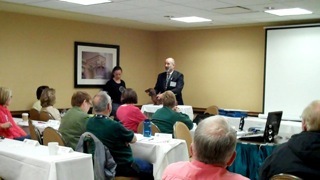 The majority of breed study presentations were made by parent club approved people. They consisted of Judges Education Chairpersons, breed club members, club presidents and breeders/owners/judges. 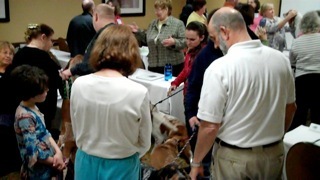 The passion for breeds was obvious during the presentations as evidenced by the personal anecdotes, experiences, and stories about notable dogs in particular breeds. 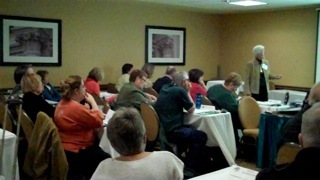 The institute costs are not exorbitant for the breed knowledge and experiences that attendees receive. 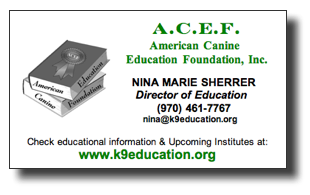 I had attended one of the general ACEF Judge’s Institutes in Crystal City, Virginia, several years earlier where attendees were introduced to canine structure, dentition, ethics, and other general issues related to judging and the AKC. This breed institute was different. Mainly it was breed specific, more compact, and more information was provided in a more condensed time from 8am to 9pm each day except Sunday, which was an abbreviated day of sessions to allow for travel schedules. Is it worth the time, effort, and expense? You betcha!!!! Dr. Bob G. Smith who wrote the article lives in New Orleans LA. His initial breed was a Cocker Spaniel and he currently judges 28 Sporting breeds and has Prov/Permit for the Sporting Group. He also judges Junior showmanship - All breeds. He wrote for the Canine Chronicle.